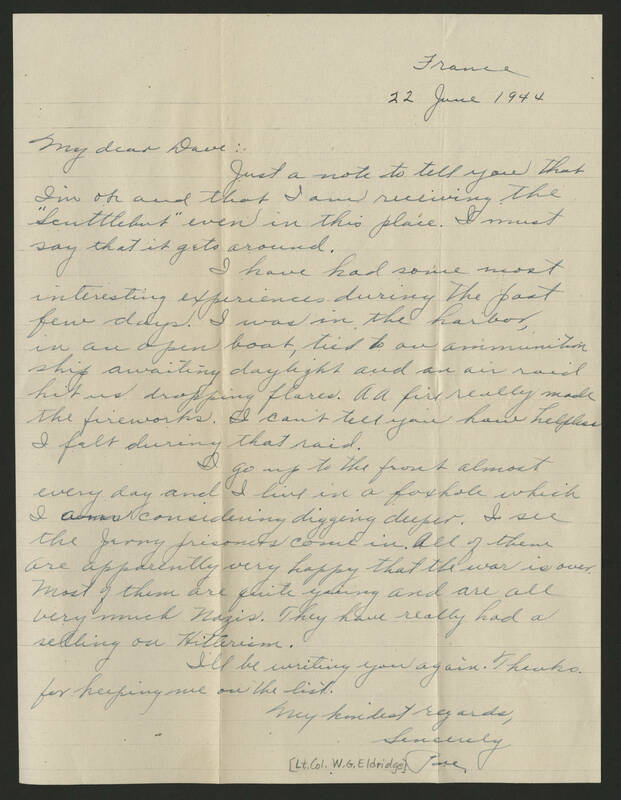 France 22 June 1944 My Dear Dave: Just a note to tell you that I'm ok and that I am receiving the "Scuttlebut" even in this place. I must say that it gets around. I have had some most interesting experiences during the past few days. I was in the harbor, in an open boat, tied to an ammunition ship awaiting daylight and an air raid hit us dropping flares. A A fire really made the fireworks. I can't tell you how helpless i felt during that raid. I go up to the front almost every day and I live in a foxhole which I am considering digging deeper. I see the Jerry prisoners come in. All of them are apparently very happy that the war is over. Most of them are quite young and are all very much Nazis. They have really had a selling on Hitlerism. I'll be writing to you again. Thanks for keeping me on the list. My Kindest Regards, Sincerely [Lt. Col. W.G. Eldridge] "[illegible]"